How does our charitable donation benefit our business? 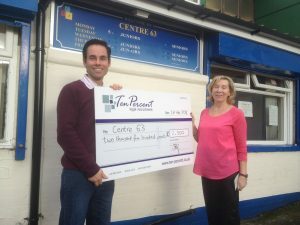 Jonathan Fagan, MD of Ten-Percent and Trustee of the Ten Percent Foundation with Jeane Lowe, manager of Centre 63, one of the charities supported in 2015 and 2016. The Ten-Percent Foundation was set up in 2002 as a charitable trust specifically to distribute the donation Ten-Percent.co.uk Limited gives each year to charities. This includes the Ten-Percent Group of recruitment websites, which includes our Legal Recruitment services (ten-percent.co.uk, interimlawyers.co.uk and jonathanfagan.co.uk) and also our subsidiary company TP Transcription Limited (tptranscription.co.uk and universitytranscriptions.co.uk). We donate 10% of net profits each year to the Foundation, which is a registered Charitable Trust in the UK (reg no 1095812). This is following the tithe principle from mediaeval times, although there are no links between the company or the charity to any religion. The Directors of Ten-Percent.co.uk Limited are firm believers in the notion of corporate responsibility and we strongly encourage businesses around the world to take a similar step. However we are also keen to support the principle of accountability for charities. We think too many of them have turned charitable giving into a business activity and have forgotten that they only exist because of the good wishes of their fellow men & women. So we have a campaign to a) encourage other businesses to donate a percentage of their profits to charity every year, and b) to highlight and campaign against excessive staff salaries in the charity sector. We prepared a report on choosing charities to donate to without supporting high salaries or costs in 2016 and plan to launch a website soon detailing the same. http://www.ten-percent.co.uk/choosing-charities-to-donate-money-to-without-supporting-high-salaries-costs.pdf. We have a page detailing other companies who donate a percentage of profit or turnover to charitable causes – details of these can be found here. Our commitment to annual charitable donations is set down in our Articles of Association. So far we have donated over £100,000 (to 2018). It is our business aim to ensure a healthy growth for the company and at the same time spend 10% of our income supporting charitable causes both here and overseas, usually in Africa. We enjoy the process of giving away our profits each year (once we have got over watching the money disappear from our bank account!) but it is always nice to get positive responses from the charities we donate to and it makes us feel a bit better. We try to find charities with specific projects we can follow up on, and prefer smaller sized charities to the large ones, especially those with CEO’s earning shed loads of cash (you know who you are – click here for our article on this). We are also keen to support any small charities started by solicitors or related to the legal profession. A list of the donations we have made to date can be found on our Projects page. In 2000-2001 we donated £500. In 2001-2002 we donated £1,983.80 to the Ten-Percent Foundation. In 2002-2003 we donated £3,943.40 to the Ten-Percent Foundation. In 2003-2004 we donated £4,076.40 to the Ten-Percent Foundation. In 2004-2005 we donated £5,652.00 to the Ten-Percent Foundation. In 2005-2006 we donated £6,602.90 to the Ten-Percent Foundation. In 2006-2007 we donated £8,757.20 to the Ten-Percent Foundation. In 2007-2008 we donated £7,350.00 to the Ten-Percent Foundation. In 2008-2009 we donated £1,128 to the Ten-Percent Foundation. In 2009-2010 we donated £3,952 to the Ten-Percent Foundation. In 2010-2011 we donated £3,865.30 to the Ten-Percent Foundation. In 2011-2012 we donated £902.10 to the Ten-Percent Foundation. In 2012-2013 we donated £7,450.20 to the Ten-Percent Foundation. In 2013-2014 we donated £10,656.00 to the Ten-Percent Foundation. In 2014-2015 we donated £13,549.70 to the Ten-Percent Foundation. (Letters of receipt from charities for donations 2014-2015 can be found here). In 2015-2016 we donated £11,722.74 to the Ten-Percent Foundation. In 2016-2017 we donated £9,887.14 to the Ten-Percent Foundation. In 2017-2018 we donated £8,214.49 in total. TP Legal Recruitment donated £5,530.35, TP Transcription Limited donated £2,342.11 and TP Recruitment Limited donated £342.03. The Ten-Percent Foundation is a charitable trust, registered with the Charities Commission, and operated by two trustees, one of whom is a director of Ten-Percent.co.uk Limited. The trust distributes the funds raised by Ten-Percent.co.uk Limited, TP Transcription Limited and TP Recruitment Limited according to the set of principles below. So far the Trust has donated to Send a Cow, Wateraid, British Stroke Association, The Parkinson’s Disease Society, Clwyd Riding for the Disabled, National Childbirth Trust, a Liverpool inner city project, Cecilys Fund (funding orphans to go to school in Zambia) and provided funding for a Youth Worker in an inner city area of Stoke on Trent. We have given money to a local sports club, funded assistance for two disabled children in the Vale of Clwyd attending playgroup, given money to LawCare and funded a small specialist charity in Uganda. 2014 donations have been to Thurrock Citizens Advice Bureau, Merseyside Welfare Rights Bureau, Lincolnshire Abucopter & Childrens Wish (a Round Table charity – both at the request of Hodgkinsons Solicitors – one of our member firms) and Alder Hey Childrens Hospital. 2015 donations have been to the British Stammering Association, Y Care International, Standalone, the Kilimatinde Trust (Tanzanian charity supporting 5 children through their schooling), Chester Zoo, LawCare, Knowsley Domestic Violence Service, Centre 63, Ace of Clubs (at the request of Hanne & Co, our clients), Northop Hall Girls FC and others. 2016 donations have been to the British Stammering Association, LawCare, Centre 63, Ace of Clubs, The First Step, Northop Hall Girls FC, Kilimatinde Trust, Unlock, Reprieve and Halkyn CC. 2017 donations have been to LawCare, British Stammering Association, Centre 63, Ace of Clubs, The First Step, Kilimatinde Trust, Unlock, Reprieve, Cure Parkinsons Trust, Flying High Trampolining, Northop Hall Girls FC and the Liverpool Diocese. 2018 donations have been to The First Step (£2,500), Centre 63 (£2,500), Kilimatinde Trust (£2,200) and the British Stammering Association (£2,000). Clare Fagan, one of the directors of TP Legal, has also provided CV workshops to a Flintshire mental health charity in 2017 and 2018. 2019 donations made to The First Step (£2,500), Centre 63 (£2,500), Kilimatinde Trust (£2,200), the British Stammering Association (£2,000), Cure Parkinsons Trust (£1,000), Reprieve (£500). This is the final set of donations to The First Step, Centre 63, Kilimatinde Trust and the British Stammering Association. In total we have donated £12,500 to The First Step, £12,500 to Centre 63, £11,000 to the Kilimatinde Trust and £10,000 to the British Stammering Association as part of a 5 year commitment to the charities. 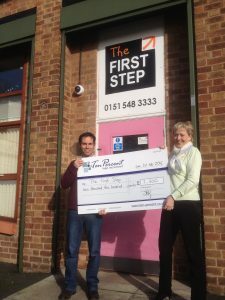 Jonathan Fagan, MD of Ten-Percent Legal Recruitment with Angela Cholet, CEO of The First Step, one of the charities supported by the Ten-Percent Foundation in 2015 and 2016. As a matter of policy we will not donate to charities where the Chief Executive is paid more than £75,000. We believe that any charities able to afford salary levels higher than this are clearly not in need of charitable donations. We try and continue to support projects once we have started to donate money although our longer term programmes were unfortunately interrupted by the recession. Ten-Percent.co.uk Limited has a commitment in its’ Articles of Association to donate a percentage of the annual profits after tax to charity (this is not set at 10% but in an ideal world we would love to continue donating 10% indefinitely). For over 15 years we have donated at least 10% of our profits, but there may be years to come where this does not occur.